Malcolm IV, or Máel Coluim mac Eanric was born around 1141, and was the eldest son of Henry of Scotland, Earl of Huntingdon and Ada de Warenne, daughter of William de Warenne, Earl of Surrey and Elizabeth de Vermandois. 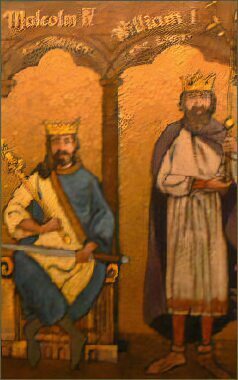 Malcolm's father, Earl Henry, the only son of David I, had been seriously ill for a prolonged period and died on 12 June, 1152, but left three sons. As the eldest of these and the new heir to the Scottish throne, his grandfather sent Malcolm on a circuit of the kingdom, accompanied by Donnchad, Mormaer of Fife, who was styled rector, possibly an indication that he was to hold the regency for Malcolm on David's death. As it turned out, Donnchad did not long survive David, holding the regency for a year before his death in 1154. After the death of his grandfather on 24 May, 1153, Malcolm suceeded to the Scottish throne and was was inaugurated as king on 27 May 1153 at Scone . Aged only eleven when he came to the throne, he was fated to be referred to thereafter as 'the Maiden'. Malcolm bears the distinction of being the last King of Scotland to bear a Gaelic name. Malcolm inherited the Earldom of Northumbria, which his father and grandfather had gained during the wars during the time of the Anarchy in England when King Stephen and the Empress Matilda had fought for the English crown. Malcolm granted Northumbria to his brother William, retaining Cumbria for himself. While Malcolm delayed doing homage to Henry II of England for his possessions in England, he finally did so in 1157 at Peveril Castle in Derbyshire and later at Chester. Here King Henry refused to allow Malcolm to keep Cumbria, or William to keep Northumbria, but instead granted the Earldom of Huntingdon to Malcolm, for which Malcolm did homage. He later fought with the English King in France and was present at the siege of Toulouse. Malcolm never married or had issue. Pious and frail, he is purported to have taken a vow of celibacy. He reigned for only twelve years and died of undefined causes at the age of twenty-four on 9th, December 1165. His premature death may have been hastened by Paget's disease, a chronic disorder that typically results in enlarged and deformed bones. He was buried at Jedburgh Abbey, which had been founded by his grandfather, David I and was succeeded by his more martial younger brother, William the Lion.